Tom and Judy Parma both worked on jingles from the late 1950s until their retirements almost 50 years later. Sadly they died within three days of each other in 2014, ending a 50+ year marriage. Tom and Judy were loved and respected by their peers and clients in the Dallas jingle industry. Judy had perfect pitch as a singer. She was also probably the quickest sight-reader of all the many talented female singers in town, and rarely was a retake on a vocal required because of an error in Judy's part. She graced jingle packages at PAMS, CRC, Gwinsound, TM, JAM and many other lesser-known companies with her clear alto voice. But Judy could also sing the high parts when required and was the lead soprano at TM in that company's early years. In later years she wrote vocal adaptions at JAM and played keyboard on occasion. 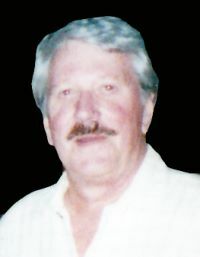 Tom was a jingle jack-of-all-trades, beginning at Futursonic in the tape editing room in the late 1950s. He became a salesman and occasional novelty part singer at PAMS before moving to other companies including TM Productions. 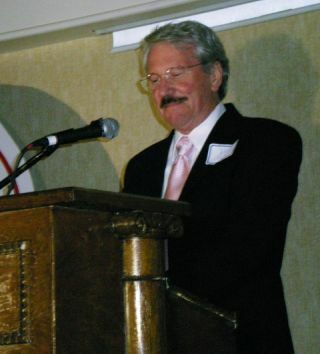 He started two of his own companies, Totalsound in the late 60s and then later Parma Productions in the mid-70s. Tom also became quite adept at using the Sonovox, a device that made his voice sound like an instrument. For more on this grand couple's jingle exploits, please see my second jingle book entitled, "The Second Jingle Book," which features interviews with Tom and Judy. It's available here. Jingle producer Tom. Parma and his wife, Judy, the lead vocalist you hear on jingles coast to coast, have been in the Dallas jingle industry for almost twenty years. As a team, they've created jingles for hundreds of radio stations in the U.S. and even in many foreign countries. 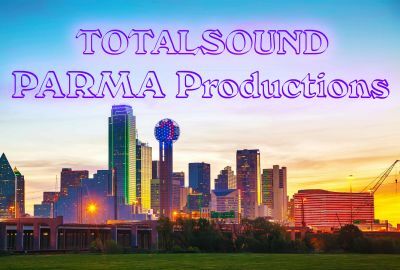 Recently, after many years with the major production companies, they have organized Parma Productions, their new Dallas based firm specializing in radio ID's produced on a one-to-one basis. Rather than through in-house or road salesmen, Tom and Judy now work directly with Program Directors. FRED accepted the Parma's invitation to attend a jingle recording session and view, as a Program Director would, how jingles are recorded. Within minutes after arriving at DFW airport, we were on our way to the new studio in North Dallas. I asked Judy what was on the agenda for today's session. "Today is a good day for you to follow a jingle package through to completion, because we've scheduled the vocal and mixing sessions back to back so that we can completely finish the package for a station in Michigan that goes on the air next week. We also plan continuous sessions for Program Directors who like to come to Dallas for their sessions. It's rare that they have to be gone from the station for more than a day or a day and a half. This is a huge package, so generally like today, we start with a morning vocal session. The singing will take about four hours. When that's done, we mix all the tracks to mono or stereo masters for the station. Editing and leadering each cut along with mixing, adds another six or seven hours. Though it takes time, if the PD were here today, he'd be on the plane tonight with his new jingles and could be carting them in the morning." When we arrived at the studio, the singers were already gathered near the coffee machine in the lounge area. More awake than FRED, Linda Harmon, Frank Bloebaum, Brian Beck, and Chris Kershaw were introduced as the singers, who along with Judy, make up the five voice Parma vocal group. When the singers assembled in the studio, we joined Tom in the control room with the recording engineer, Tommy Loy, who was making preparations to start the session. Tom explained some of the equipment, but particularly fascinating, was the 24 track recorder that seemed to be operating by itself. "Unlike making records, everything happens much faster in a jingle session. So in addition to operating the control board, the engineer who is also like a co-producer, operates the recorders himself with remotes. Not only does he have controls for all the usual recording functions, but with the flick of the 'auto-locate' button, the machine will automatically return the tape to any desired spot in the jingle, readying itself for recording again. This allows us to rapidly repeat the performance until it's the way we want it. The engineer uses those few seconds to readjust the controls on the board and whatever else is necessary to keep the flow of the session going. And of course, it's much easier for the group to deliver a good performance when they're not waiting on an engineer to cue up the tape each time. "Years ago, before multi-track recorders were developed, we had to record the entire orchestra simultaneously. Sometimes there were clunkers that no one heard until the orchestra was already gone. Now, we build flawless jingles track by track, one at a time. Then to mix the station's master, we reverse the process and equalize, balance and treat each track separately before all the instruments are combined. The price of production hasn't gone up much at all considering the work involved and the advances we've made. I think this is even more impressive when you consider the cost of studio equipment today." Like a pilot and copilot, FRED watched as Tom read off settings to Loy who made adjustments to dozens of sliders, switches and knobs for the first jingle. Finally, the track was played to the singers. Then both Tom and the engineer looked to Judy for comment on the balance of instrumentation in the earphones. "The rhythm section can stand to be a bit louder...strings and brass are O.K. though. (Loy rebalanced the tracks piped into the singer's earphones, then played the track several more times as the group warmed up.) Sounds better... want to start recording? (three more times, and Tom signaled for a playback over the large speakers in the studio and control room.) I think we have one... Let's listen again, (After everyone agreed it was a take, they overdubbed by singing with the first recording of their voices. We could hear both sets of vocal through the monitors and the singers could hear the same through their earphones.) Another good one...let's check both layers of the vocal again. (The jingle began to sound fuller with the additional vocal overdubbing) O.K., now a third time." Stacking the vocal adds real excitement and life to the jingle. As a matter of fact, on almost every current record I can think of, the artist's voice is stacked somewhere in the song. Overdubbing, or stacking, is used extensively...especially in groups. For instance, the Bee Gees stacked their voices like crazy through-out 'Stayin' Alive'. Can you imagine that song any other way? Stacking five voices three times (15 voices) doesn't necessarily make us sound like the Mormon Pumpernickel Choir either. When you know what you're doing, the overdubs add enough guts and fullness to make the vocal sound exciting and confident. It sounds so damned much better than without, we've been doing it since day one...even though it's three times the work." The vote for a take was unanimous after several checks of the playback mix of all the tracks. Loy played the jingle one more time at the singer's request, just for the pleasure of hearing the result. of everyone's combined efforts. The next jingle went as well as the first, and FRED observed that everyone else was enjoying the session too. We asked Torn if this was typical of their sessions. "I would say it is. The production is fun, the studio is very modern and the combination of talent is damned good chemistry. And we all enjoy our work. The group puts a lot of heart into the sessions, and all of them care how each jingle sounds. Not only are they all perfectionists, they are all expert musicians, including our engineer, Tommy Loy. He's so good, he may also be responsible for the success of the Dallas Cowboys by playing the National Anthem at all their games...at least that's what he's been telling us since the Super Bowl. "The studio and equipment have a lot to do with the success of a session too. You do your best work when everything is comfortable and all the equipment you need is dependable. So, yes...we actually have a lot of fun in our sessions. I think that's important because people can hear the difference in the jingles when everything goes smooth. We sure as hell can, so we make a point of it." "Well, this concept began with a notebook full of ideas we'd collected, and a lot of good suggestions given to us by Program Directors from all over the country. This is really necessary when you're spending the kind of money we do on jingle production, so we always talk to as many PD's as possible to find out what the needs and trends are before we cut a note of any jingle. Anyway, we finally decided to work the best of all these ideas into the 'You Can Feel It All Over' theme, which we all agreed had the best latitude for image and station promotion. We based this on the fact that the 'hook line' doesn't try to pin down any finite detail. The line leaves that up to the station. In other words, 'IT' is anything the PD wants it to mean at any time. "After that was decided, it took a couple of months of writing before we were finally ready to go to Wally Heider's studio in Hollywood with our mountain of music. We went there to record the rhythm instruments for the entire package. Oh, and in addition, we also added all sorts of percussion toys and keyboard things that filled up a lot of the 24 tracks we started with. "Back in Dallas, we added the brass section, and on another session, the strings. Finally, the harp, French horn and other incidental instruments completely filled up the remaining 24 tracks. So, before we could record the vocal, we had to do some combining and regrouping to free up a few tracks. Today, we can do that right on the master. And with the advent of Dolby, we don't lose any quality whatsoever. "Then with the tracks in perfect shape, we then went to work on the vocal. That took the longest...two days and nights of singing and mixing. The time was well spent though, because of what we do with the vocal, it very much determines the attitude and emotion of the jingle, and that's what this particular package is all about. "After a couple of weeks, just listening to the jingles and writing the demo copy to explain the concept, we brought in WNBC Assistant Program Director Jay Stone to do the voicing and help with the demo production. "Then there was artwork, lyric sheets, printing, and all the rest. It's a lot of work but worth it when PD's and their managers tell you they're crazy about the jingles and that everything sounds as good as we promised it would." "Radio people have a right to expect their jingles to sound as good as the demo. It's like ordering from the Sears catalogue. Whether a particular jingle company sells good, better or best, you can rest assured clients want at least the best that can be delivered. That's why we always use the same singers with the same mikes, and record and mix with the same balance of instrument, E.Q. and echo. In other words, when we have what we want on the demo, we simply duplicate the procedure for each station thereafter. The settings I read off to Loy, are the control board levels, et cetera, of the original jingles on the demo. Twenty-four tracks of information is still a lot to contend with if you are striving for perfection, so we always double check our mixes against the demo to be certain. "We usually begin mixing the longest version of a jingle first to get the balance we want throughout the full length of the jingle. That done...the shorter versions are then 'lifted' electronically with the aid of the mixing console, which is capable of making edited versions that would be impossible to do with a razor blade. Acapella versions are simply a matter of turning off all the instrumental tracks and then balancing the vocal tracks." With that, Tom and Loy mixed the sixteen basic jingles into over fifty different cuts. It began as blank tape in Hollywood and ended up at the new FM station in Michigan...several hundred man-hours later. For more information on PAMS jingles, go to the PAMS Website.